Garages are a convenient entranceway into your home, which is why many unwanted intruders will specifically target your garage, especially if you don’t have a proper security system to stop them from gaining access. The experienced professionals at Perfect Solutions Garage Doors strongly encourage you take the necessary precautions to keep your garage safe from intruders. It will definitely make it harder for criminals to break into your garage if you practice these simple security tips. Modern garage doors openers are now available with rolling-code technology and fingerprint recognition capabilities to make it significantly harder for criminals to access your automatic opener. Please contact Perfect Solutions Garage Doors for a free quote on any of our brand name garage door openers if you live in the Sacramento, Auburn, El Dorado Hills, Roseville, or Rocklin, CA area. Many people will leave the door between their garage and home unlocked for easier access. Even if you have a solid steel garage door with the highest level of security features available, it should be kept locked at all times. You should also install a peep-hole and deadbolt on the interior garage door, just like every other exterior door to your home. It may sound pretty obvious to most people, but many people leave their garage door open during the day. Although potential intruders may not attempt to break into your home while you are there to protect it, leaving the garage door open will advertise to potential criminals the valuables that are inside of your garage. If you have nice stuff, it could inspire them to visit your home when you are not there. One mistake that most people make is leaving their automatic garage door remote inside their car. Thieves can break into your car, take the remote, and then use it to break into your garage. Using a keychain remote that stays with you whenever you go is a smart way to keep your garage safe from intruders. You should strategically place outdoor sensor lights throughout your property, especially around the entranceway to your garage. 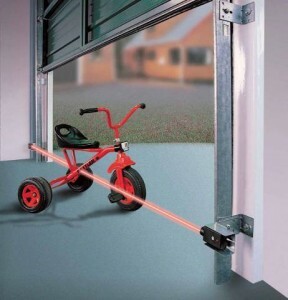 These lights will keep your garage and home safe by scaring off any unwanted intruders. Investing in a better opener, locking the interior door, keeping the garage door closed, buying a keychain remote, and installing sensor lights are all proven methods for keeping your garage safe from intruders. Please feel free to contact Perfect Solutions Garage Doors if you need any assistance implementing these valuable security tips.